The Scottish Highlands is the home of many wonderful subjects but without a doubt one of the most beautiful subjects to be found there is the Red Squirrel. We have been working with Red Squirrels for many years and during this long weekend break, we will have exclusive use of a pair of sites to allow us to capture this iconic mammal, producing a stunning and varied portfolio. 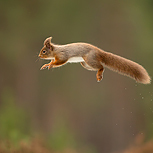 Each site offers different set-ups from simple portraits to capturing the acrobatic ability of this charming mammal as it leaps through the air, to incorporating the forest environment with wide angle shots to show the stunning forests. All in all a jam-packed short break to capture an array of images of our native Red. Day 1: Travel to get yourself to our Highland base at Glenfeshie. Our Steading is very comfortable set in stunning surroundings. We’ll arrange transfers from the local station of Kingussie (20 minutes or so away) or you can drive yourself. Over dinner we’ll look forward to discussing the options for your Red Squirrel photography ahead. Days 2 – 3: Throughout the trip we will need to be flexible based on weather conditions as well as what is working best so although the itinerary for the trip is detailed below it is very much subject to change to accommodate this as well as your own priorities as best as we can. This special four day trip is designed solely for capturing the beauty and the antics of Red Squirrel. We will be using a number of locations either at our base or in the local vicinity. We will be working exclusively at feeding stations which are expertly located for great photographic opportunities to allow some great images of these forest acrobats. All the sites have had considerable thought put into lighting and backgrounds and offer some the best opportunities of photographing them in the UK. You will be working from positioned hides or locations where the squirrels are people neutral. All the locations have been specifically chosen to allow you to come away with a varied portfolio of this iconic highland species. You will be split into small groups each day and we will make sure that you visit all our locations during your stay. The locations offer different settings and backgrounds and using different lenses and techniques we will be able to capture portraits, wide angle shots and action shots of Squirrels jumping. The days are long in the field and pack lunches are provided. It will be back to our Steading for a well-earned evening meal. Day 4: After a hearty Scottish breakfast (that you’ll have almost become used to by now) it’ll be time to head home. There will be transfers to the local station as required. Accommodation is at a clean and comfortable Steading set in the beautiful Glen Feshie. All meals are homemade with an excellent Scottish Breakfast each morning too! Rooms are based on twin occupancy – please enquire if you want to look at a single option as there is some but only limited availability. There are short walks for most activities which may be tricky if there’s lots of snow around and involve uneven terrain.